WaterLase dentistry is a gentler and more precise instrument for performing many dental procedures, such as decay removal, cavity preparation, root canals, tongue- tie, lip tie, frenectomy, gum and bone surgical procedures and many others. The American Academy of Pediatric Dentists has recognized the use of lasers for dental treatments in infants, children and adolescents, as well as people with special needs. The WaterLase Dental Laser combines water, air and laser energy to perform procedures that are typically performed with a dental drill and scalpel - without the drill, shots and tears. Many procedures done with the WaterLase Laser do not require anesthesia, which means no shots for some procedures and fewer shots for all procedures. Use of the WaterLase Laser can also reduce trauma and healing time with smaller, more precise incisions and less bleeding. In addition, less anesthesia means there is less chance for the child to experience accidental cheek and lip biting. WaterLase Laser dentistry is quieter, which means the patient does not become anxious over the shrill sound of the drill. By removing the fear and anxiety of having dental procedures performed, WaterLase Laser dentistry can help foster a healthier life-long mindset about oral care. 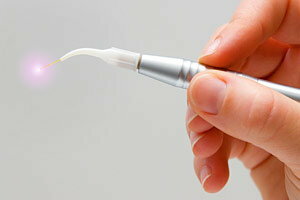 Laser Dentistry as an option for your child’s treatment. Contact us to discuss your child’s treatment options.